Hyde Park Village is one of my absolute favorite places to hang out in Tampa. Not only is it totally gorgeous, but there are fabulous boutiques, local culture, and the yummiest restaurants around! The area is booming, with new retailers moving in daily, so there is always something new to discover. If you’ve been around here awhile you’ll know that I take pictures here ALL the time, and I recently thought it would be fun to share what I love most in Hyde Park. Today’s topic (and a personal favorite): Restaurants! bartaco– If there was one food group I could live on it would be tacos, hand’s down! What I love about bartaco is that they serve “street style” tacos so each one is only about 3 bites- which means you can try a bunch of different ones each time you go! Their bowls are also top notch and chips & guac are on point… and those margaritas are YUM! Timpanos– Stepping into Timpanos in Hyde Park is like stepping back in time to a 1940s jazz bar. It’s a total “experience” if you know what I mean & a perfect fancy date night spot. I love their atmosphere & the fact that there’s almost always a jazz band playing- I feel like it makes the food taste even better 😉 They are known as a chophouse- so get ready for some great surf and turf selections! On Swann– They are one of the newest restaurants in Hyde Park but they have made their mark! I didn’t know it was possible to be obsessed with a Kale Salad- but there’s is truly the best I’ve ever had! Last time I was there I also indulged in the fresh, homemade doughnuts and they were heaven on earth. The cocktail menu is also on point- get ready to fill up on lots of goodies here! Fun Fact: this is where today’s pictures were taken! Wine Exchange– I mean, there is wine in the title… need I say more 😉 ha! While they have an extensive and great wine menu- they also have great food. I love their take on a Spanish salad (I love green olives) which is reminiscent of the Columbia’s 1905 salad. And their charcuterie is yummy as can be! So cute! 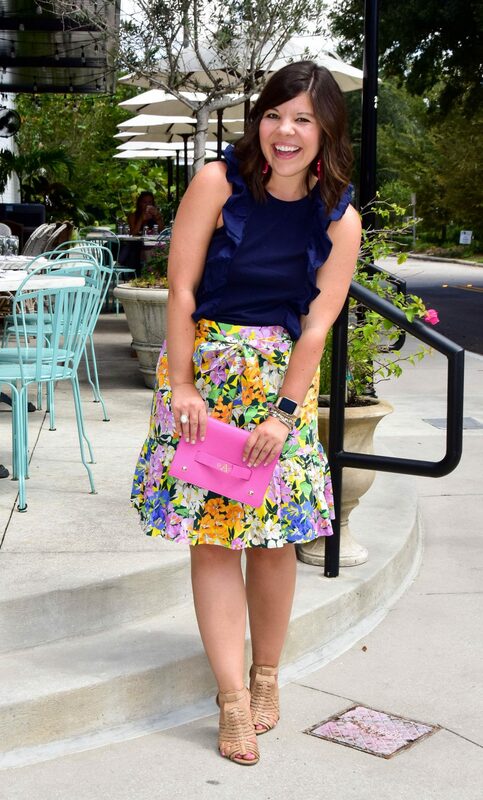 I love anything navy blue and pairing florals with it is the perfect touch! 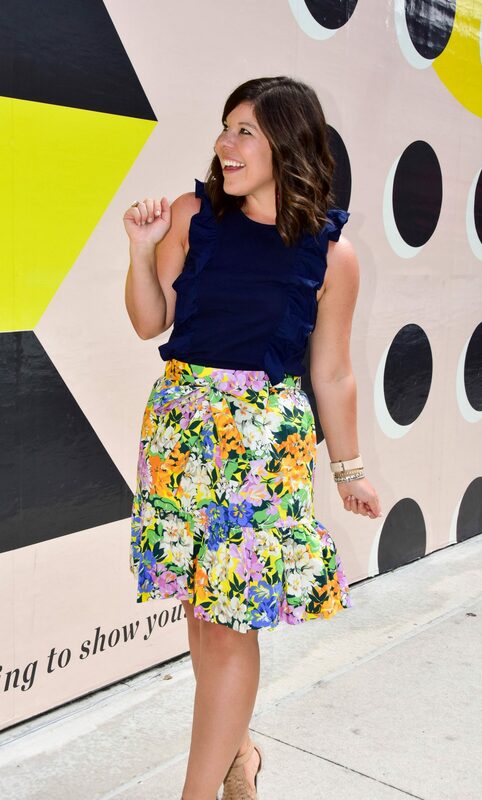 What a cute skirt! 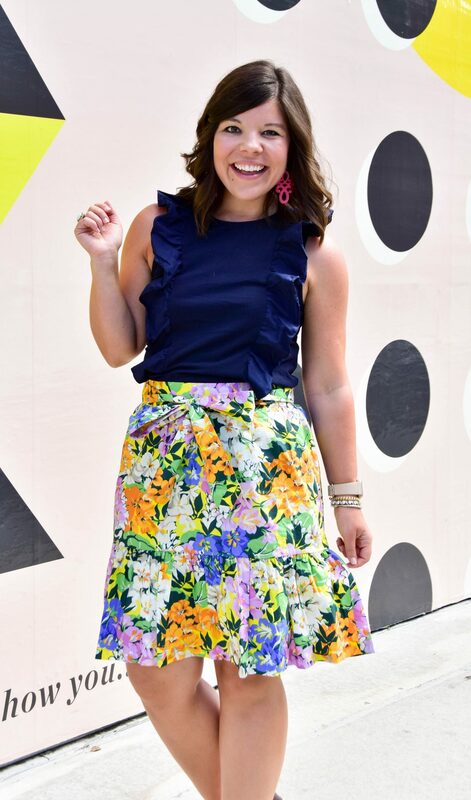 I love the print and how you styled it! Love the entire outfit! The skirt is SO cute! 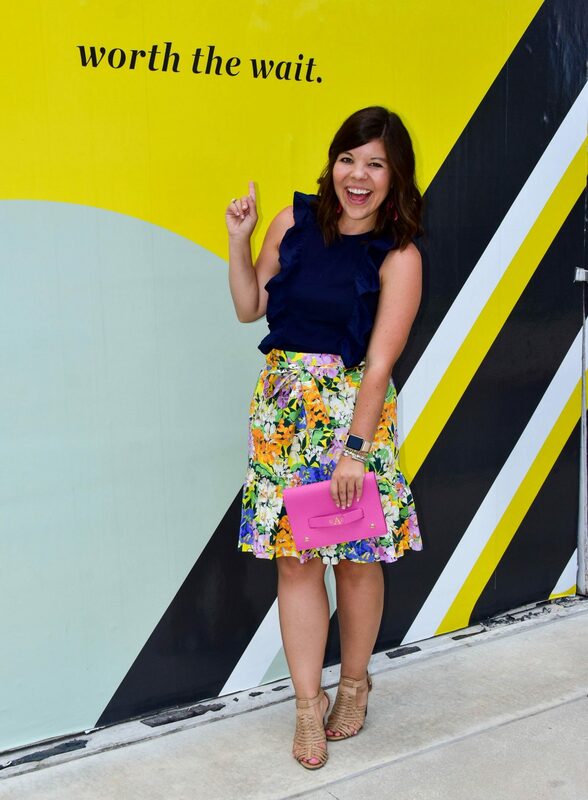 This outfit is so fun! I love the little monogram on your purse. All of these restaurants sound so yummy! 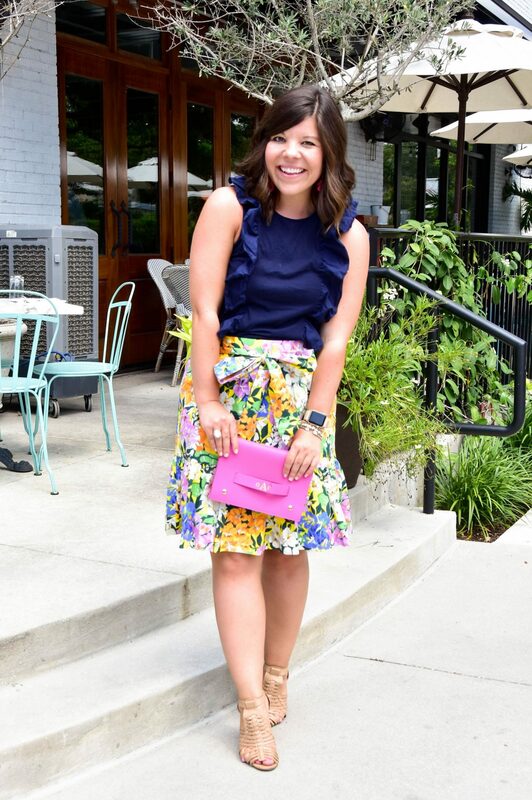 I love this fun skirt, it’s the cutest! My grandparents used to live just outside Tampa and i would go all the time. I haven’t been in years; and it’s awesome to hear that this area is getting so fun and cool! I totally need to go back. I’ve always wanted to visit Tampa! This is such a good guide! That’s a super cute outfit. Love the colors. You’re absolutely adorable and I am 100% bookmarking this for future travels! Come on down & visit! You have the cutest skirt dear! 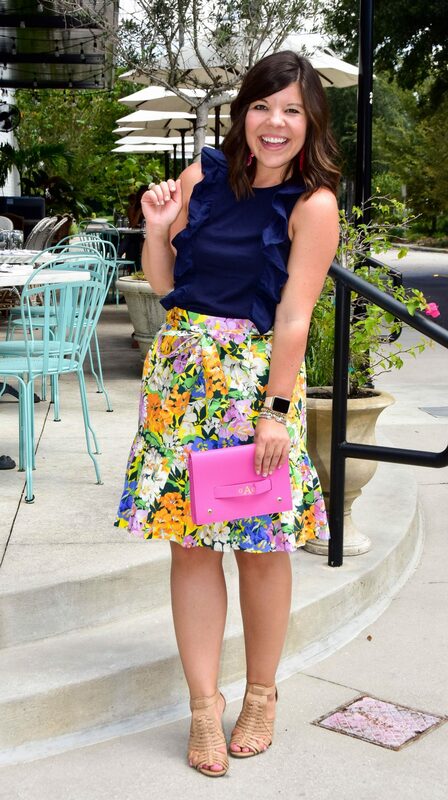 I love it, really adorable colors from the floral print. 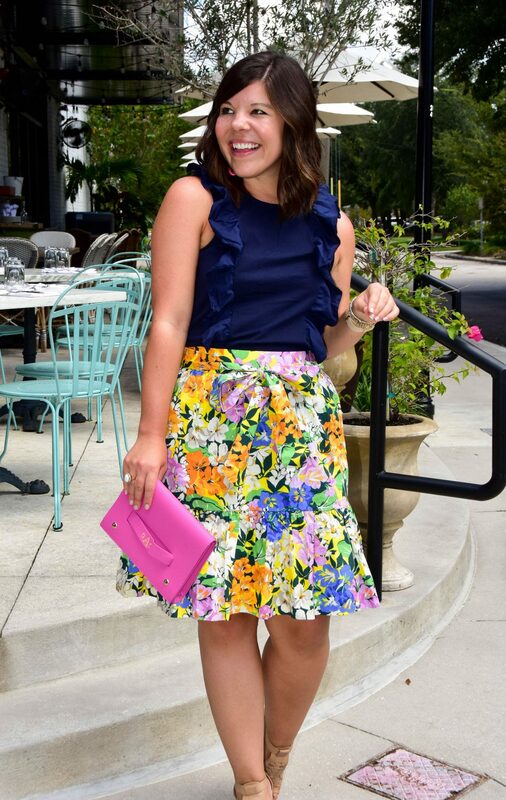 Such a cute contrast for the ruffled top. I haven’t been to Tampa in YEARS!! I never remember it being known for it’s amazing restaurants so I’m excited to come back and check it out! Come on and visit anytime girl! I’d love to show you around! 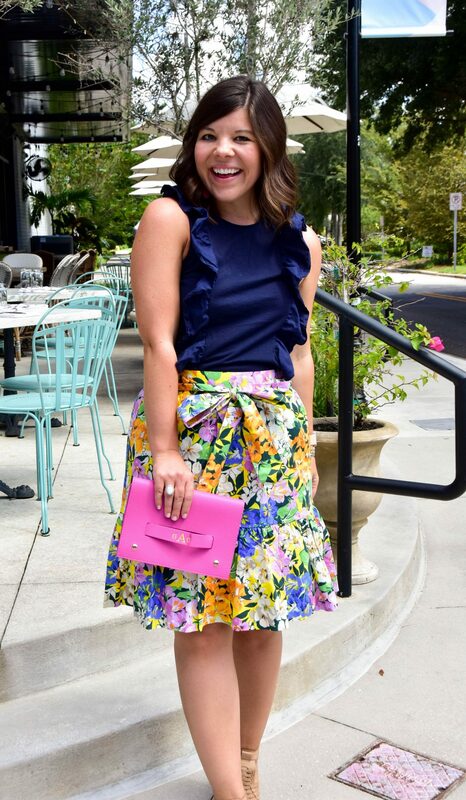 Such a cute and girly outfit! Love it. 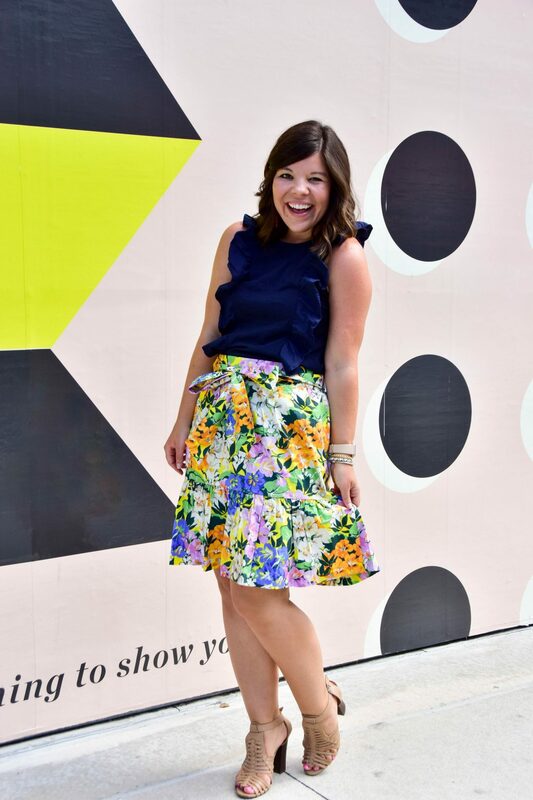 Oh my gosh that skirt is so darn cute!!! Love it! How stinkin cute are you! Love this guide and I’m saving it for later! Bartaco is one of my favorites!! Need to visit Tampa. You look so pretty! !